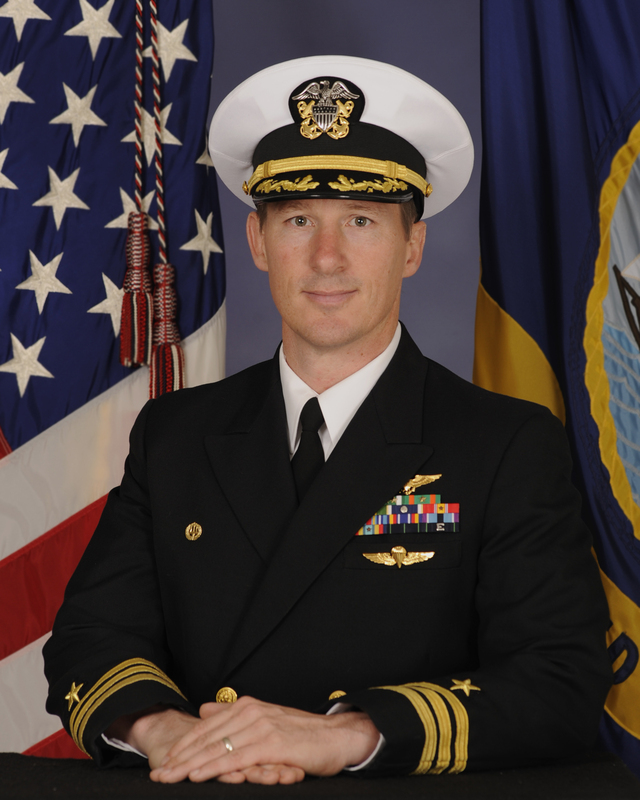 CDR Timothy J. Burke, a native of Saegertown, Pennsylvania, enlisted in the Navy under the Nuclear Submarine Propulsion Program following high school graduation in 1992. A year later, he was accepted into the United States Naval Academy and received his commission as a member of the Class of 1997. Graduating with distinction, he was awarded a Bachelor of Science degree in Mechanical Engineering. He completed flight training and was designated an Unrestricted Naval Aviator in 1999. CDR Burke served his initial sea tour with Helicopter Combat Support Squadron EIGHT (HC-8) in Norfolk, Virginia, flying the venerable H-46D Sea Knight. As a Dragon Whale, he deployed on USS DETROIT (AOE-4) in support of OPERATION ENDURING FREEDOM. Following return from deployment, CDR Burke was selected for the United States Test Pilot School (USNTPS) Cooperative Education Program with master program study at the Air Force Institute of Technology at Wright Patterson Air Force Base in Dayton, Ohio. He completed USNTPS as a member of Class 127, also earning a Master of Science degree in Aeronautical Engineering, and was assigned to Air Test and Evaluation Squadron TWO ONE (HX-21). Following fleet replacement training in the MH-60S in San Diego, California, CDR Burke reported to HX-21 as MH-60S Project Officer/Test Pilot and NATOPS Instructor/MH-60S Platform Coordinator. He was involved in developmental test and evaluation of the Armed Helicopter Weapon System, Airborne Mine Counter Measures, Ground Proximity Warning System, Software, and Human Factors/Workload testing programs. In June of 2007, CDR Burke returned to the Fleet in Norfolk, Virginia, with Helicopter Sea Combat Squadron TWO SIX (HSC-26) where he served as the Tactics Department Head and Detachment THREE Officer-in-Charge aboard the USNS SUPPLY (T-AOE-6) deployed in 5th Fleet supporting the Global War on Terrorism. In April of 2008, CDR Burke transferred to Helicopter SEA Combat Squadron TWO EIGHT (HSC-28), also in Norfolk, where he served as Safety Officer, Detachment FIVE Officer-in-Charge on board the USS KEARSARGE (LHD-3) during OPERATION CONTINUING PROMISE 2008, Detachment THREE Officer-in-Charge aboard the USS IWO JIMA (LHD-7) during OPERATION JUPITER SENTINEL, and Operations Officer. In November of 2010, CDR Burke transferred to the USNTPS where he served as Administrative Officer and Senior Rotary Wing Instructor. He re-designated to Aerospace Engineering Duty Officer in 2012. In October of 2014, CDR Burke reported as Chief Test Pilot to HX-21 in later fleeted up to Commanding Officer in March 2013. He lead the Blackjacks of HX-21 in over 4,500 flight and 20,000 ground hours of developmental test of all Navy and Marine Corps rotary wing and tilt-rotor aircraft and their associated airborne systems in support of training, operational combat, and operational combat support missions. Squadron milestones achieved under his leadership include MQ-8C first flight and first shipboard landing, MH-53K first flight, three MV-22B Operational Assessments including expanded CVN flight envelope, MH-60S fielding certification for the Digital Rocket Launcher Advanced Precision Kill Weapon System, MH-60S design certification for the Helmet Display and Targeting System, MH-60S Airborne Mine Neutralization System Operational Assessment, AH-1Z 401C engine upgrade certification, and first-ever CH-53E Hostile Fire Indication test with live ordinance. Additionally, HX-21 surpassed 120,000 Class A mishap-free flight hours. CDR Burke retired from the Navy in July of 2016 after 20 years of dedicated service. He flew over 3,200 hours in 54 different aircraft. His personal decorations include the Meritorious Service Medal, numerous Navy and Marine Corps Commendation and Navy Achievement Medals, and various campaign medals. He was a career-long member of the Naval Helicopter Association, the American Helicopter Society, the Helicopter Association International, and the Society of Experimental Test Pilots.